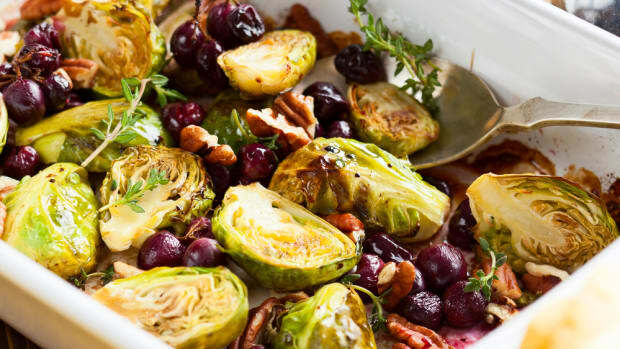 You’re prepping for this season’s holiday feast, and you definitely need a beautiful vegetable dish on the table. As part of any holiday menu, you’ll almost certainly find the gratin, the bubbly-baked dish made famous from potatoes. But a gratin can be made with all sorts of ingredients—including most vegetables!—and they can be creations of not only cheesy goodness, but of color, texture, and wonderful flavor. Read on for a step-by-step tutorial about how to make any vegetable gratin this holiday season. You’ve almost certainly eaten one of these dishes in your lifetime: potatoes au gratin, scalloped potatoes, cheesy potatoes. Whatever you call them, these browned-crust baked dishes are called gratins. At the core, a gratin is nothing more than a dish where some ingredient has been cooked to have a savory crust over it (usually made from bread and/or cheese). 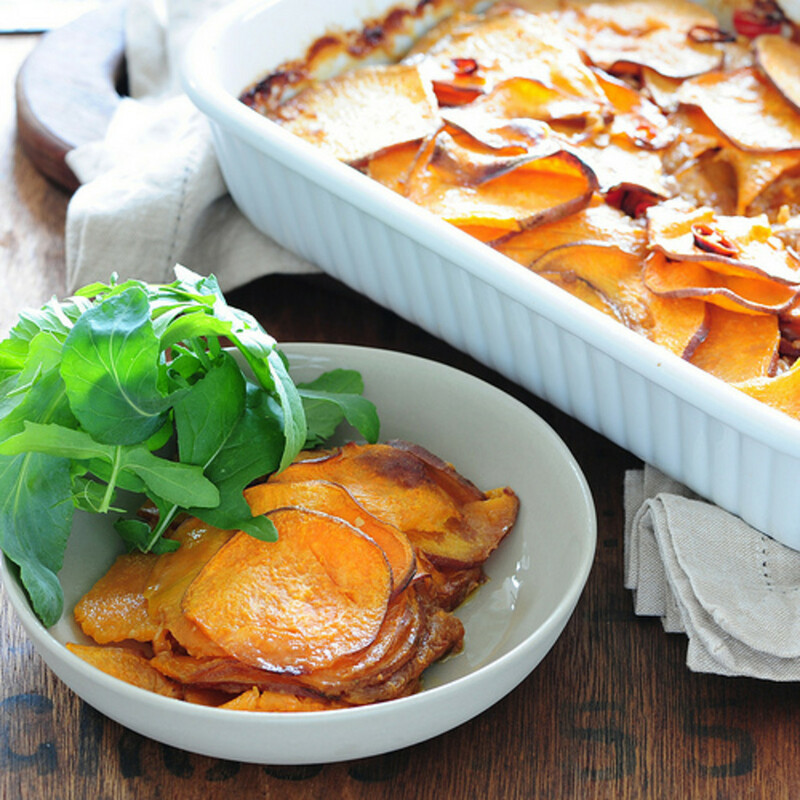 While gratins are most commonly made from potatoes, they can be made with almost anything. The name of the game is merely achieving a beautiful baked casserole with a beautiful brown crust. Start by selecting your vegetables for the gratin. 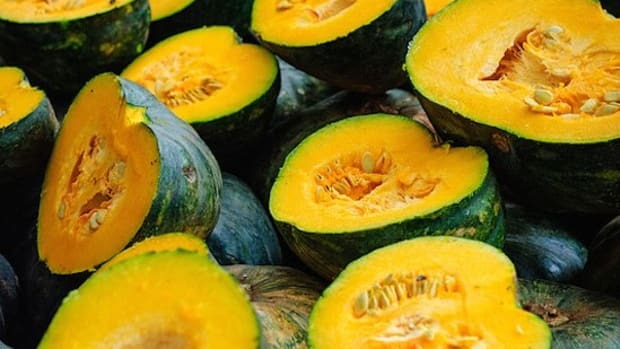 This is holiday season, so take into consideration all of the vibrant, delicious vegetables available right now: winter squash, sweet potatoes, onions, carrots, parsnips, cauliflower, beets, cabbage, Brussels sprouts, turnips—the list goes on. Don’t be afraid to pick an unusual vegetable for your gratin (maybe cabbage?) or to combine several vegetables together. Assuming you’re using a 2-quart casserole dish to cook the gratin, you’ll want about 2 pounds of vegetables. Whichever vegetables you choose, the next step is to cut them into gratin-worthy pieces. Typically, gratin vegetables are sliced into thin rounds, which allows them to cook in the oven as the casserole bakes. If your vegetables easily slice into rounds, like parsnips, turnips, sweet potatoes, or winter squash, peel them first if need be and then slice. 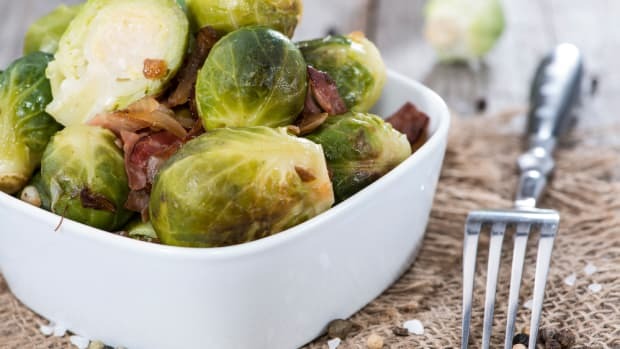 If you’re using something oblong or long, like carrots, Brussels sprouts, or cauliflower, do your best to cut them into thin pieces, even if not rounds. 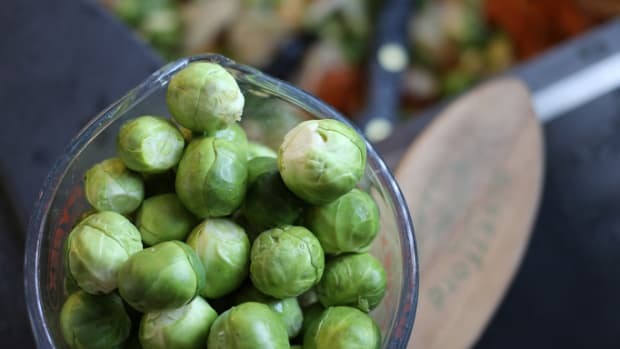 Carrots can be long, thin diagonal cuts, and Brussels sprouts can be lightly shredded, and cauliflower can be cut into rounds even if the pieces decide to fall apart a bit as you cut. 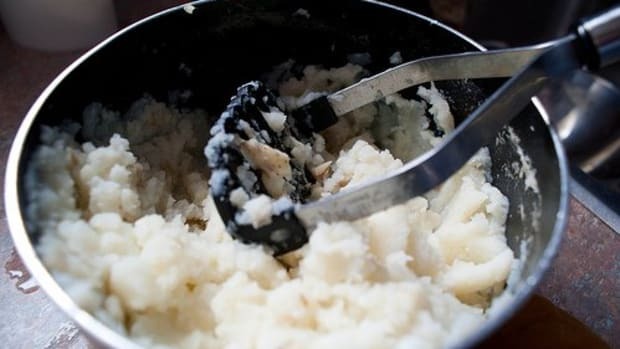 Note: If an oddly-shaped vegetable like cauliflower is just not going to cut into slices for you, cut it into chunks and blanch it lightly before using it in the casserole. This way you can have bigger pieces of the vegetable and not worry about it having to cook while in the casserole, since you’ve already blanched it. You’ll just use less liquid in the filling when you assemble it later. Now that you’ve prepped your vegetables, you can select the liquid for the filling. In this particular tutorial, we’ll be using milk in our filling, but there are indeed gratins where you can use broth, tomato sauce, or even no liquid at all in the casserole. But for the traditional, creamy baked gratin, we’re going ahead with milk. Of course, you don’t have to use dairy milk. 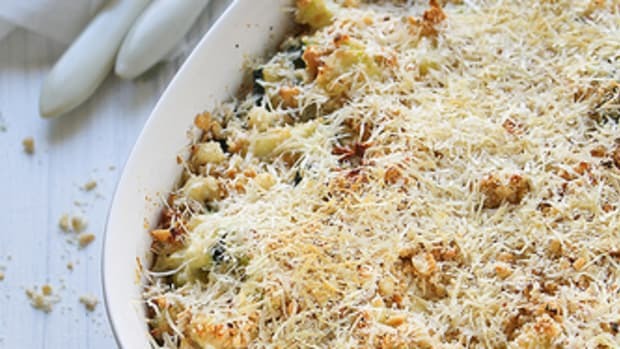 Creamy non-dairy milk choices like hemp milk or coconut milk are great options for a gratin. Ideally, you want your milk choice to have a bit of fat in it, as that’s what gives the dish thickness and stability in the end. Whichever liquid you choose, for a 2-quart casserole dish, you’ll need about 1 to 2 cups of liquid total. Finally, you’ll want to select your cheese for the gratin. The possibilities here are almost endless—just choose a hard or semi-firm cheese that will brown nicely, as opposed to something like too soft like fresh mozzarella or goat cheese. Great choices include parmesan, gruyere, Jarlsberg, or even aged cheddar. 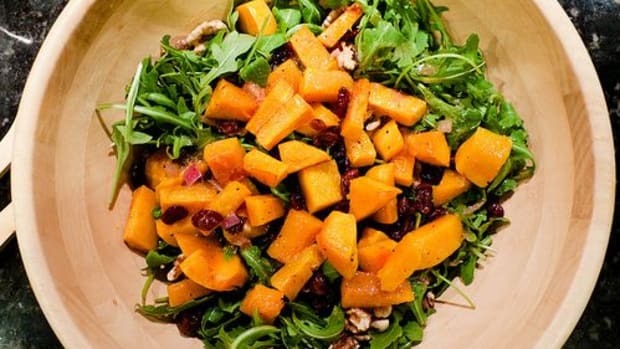 Shred the cheese so that it can be layered into the entire dish when you assemble it. You’ll want about 1 cup cheese total for the gratin. When you’ve selected your milk, you can begin assembling the gratin. Start with your 2-quart casserole dish; lightly oil it with olive oil. Now you’ll be adding your vegetables and cheese in layers until the dish is filled. Do about a third of the vegetables, then sprinkle with a third of the cheese, then sprinkle with spices and seasonings of choice. Garlic, thyme, rosemary, and salt and pepper are classic, but experiment with whatever spices you enjoy. Repeat with the remaining vegetables and most of the cheese, reserving a handful of the cheese for later. Next, pour the milk (or other desired liquid) over the ingredients in the dish. You may not need to use the full 2 cups—only enough to barely cover the ingredients. Start with 1 cup and see if the dish has enough liquid at that point to just barely submerge everything. Remember: the liquid serves to help the vegetables in your gratin cook, not to make them into soup, so add only enough liquid to help them from burning in the oven. 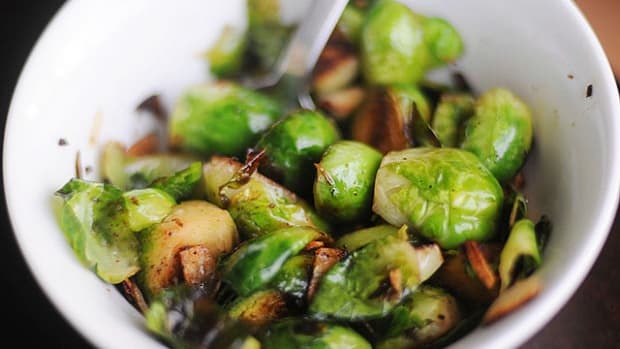 Also, if you pre-blanched your vegetables like Brussels sprouts or cauliflower, you can cut back on the liquid to just ½ cup or so, as the vegetables have already been cooked and don’t need as much liquid while in the oven. Finally, top off your assembled gratin with the remaining handful of cheese. Butter and bread crumbs can also be added to the top of the grain for an added golden crust, but I personally find that cheese alone is enough. Place your casserole dish in a preheated 350 F oven and cook until the dish is bubbly and the crust is golden, about 40 to 50 minutes. Remove from oven and cool slightly before serving. Whichever vegetables you choose for your gratin this holiday season, enjoy experimenting in the kitchen and creating your next culinary masterpiece!